Family & friends are invited to attend a Visitation on Saturday, March 30th in the Vertuccio & Smith, Home for Funerals, 773 Broadway (Rte. 107) REVERE from 9:30 a.m. to 10:30 a.m., for Retired Lt. Col. Clare M. O’Brien, who passed following a lengthy illness on Monday, March 25th. A Funeral Mass will follow the visitation at the St. Michael the Archangel Chapel, 90 Crest Ave., on the campus of the Chelsea Soldiers’ Home, Chelsea at 11:00 a.m. and immediately followed by interment in Woodlawn Cemetery, Everett. 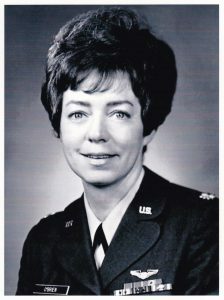 Lt. Col. O’Brien lived and was educated in Revere and was a 1948 alumna of the Immaculate Conception High School of Revere. She entered the Air Force in February of 1956 at the end of the Korean Conflict & served until & thru the entire Vietnam Era, completing twenty years of service in February of 1976. She was an alumna of the Chelsea Memorial Hospital School of Nursing in 1952. Lt. Col. O’Brien’s service history and accomplishments were many. She was the recipient of the Bronze Star, Air Force Longevity Service Award, Air Force Commendation Medal, National Defense Service Award, Vietnam Service Medal, Republic of Vietnam Campaign Medal, Air Force Outstanding Unit Award, among other commendations & achievements. After retirement, she made her home in Falmouth, MA remaining there until last year (2018). Clare was the beloved daughter of the late Ret. Revere Fire Lt. Jeremiah R. O’Brien & Eleanor F. (McQueeney) O’Brien. She is the cherished sister of the late Richard O’Brien & his wife Margaret Mary O’Brien of Silver Spring, MD, the late William O’Brien & his late wife Lucille, the late Mary Jane Rainge & her late husband Hugh R. Rainge, and John P. O’Brien & his wife, Mary of Norwood. She is the aunt of Eileen M. McLaughlin of Herndon, VA, the late Kathleen O’Brien, John C. O’Brien of Mansfield, MA, William D. O’Brien of Watertown, NY, Julie O’Brien of Yarmouth, MA, Beth M. DiBiasi of Windsor Locks, CT, Elisabeth Rainge of Wayland, MA, Maryellen St. George of Gainesville, VA, and Kristine R. Gatesman of Acton, MA. She is also lovingly survived by many grand-nieces & grand-nephews. Saturday, March 30th from 9:30 a.m. to 10:30 a.m. In lieu of flowers, remembrances may be made to the Catholic Appeal, P.O. Box 9134, Canton, MA 02021-9134. Ob behalf of the Society of Air Force Nurses, please know we are also mourning with you the loss of our colleague and friend, Lieutenant Colonel Clare O’Brien. She was a remarkable woman who made a difference in the lives of so many in her journey through life. She was a Charter Member of our Society and a donation will be made in her memory as requested. Clare will most definitely be missed, and she will not be forgotten by the Air Force nurse community.